Sea Cliff Bagel Cafe typically is packed on a weekday morning with students from North Shore High School across the street, Long Island Rail Road commuters and employees of nearby businesses. On Tuesday morning, with far fewer customers because of the snow and icy roads, co-owner Vincent Cefalu , 55, had time to banter with two old friends. “He has a car in pieces in his garage and I want to put it together,” said David Mazzola, 55. “What I call Intact and you call intact are two different things,” Mazzola said. Mazzola, Cefalu and Tim Connolly, 46, a friend who sometimes, like on Tuesday, works behind the counter at the cafe, were sitting at tables drinking coffee in the otherwise-empty cafe when Scott Hersh walked in to order a tomato and cucumber salad. Hersh, 55, drove about two miles from his home in Glen Cove, where he’s working Tuesday because his Manhasset office was closed. A few minutes later, Louis DiMaria, 42, was buying bagels for himself and two employees of his Roslyn restaurant, Joanne’s Gourmet Pizzeria. On Monday, DiMaria had offered to pick them up in Glen Cove if counter employee Rianna Cedeno’s Honda CR-V had problems. With the brakes on the 2004 SUV not working well, Cedeno, 19, didn’t want to take a chance driving down the icy roads. DiMaria will need a lot of employees today. Cefalu said he’s “going to play it by ear and sit around and have coffee” as he decides whether to keep his cafe open until the normal closing time of 4 p.m. Motorists apparently stayed off the roads and that was evident at gas stations, too. Leone Gawan has usually seen about 50 customers by 11 a.m. on Tuesdays. This week, because of the winter storm, only four. 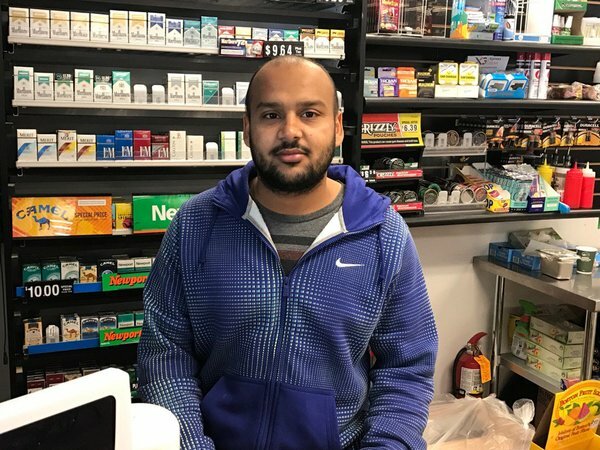 “Even our deliveries didn’t come today,” said Gawan, the manager of an Exxon gas station at the corner of Route 110 and Conklin Street in East Farmingdale, pointing to the mostly empty doughnut shelves behind him. Shovels and bags of road salt all but sold out Monday afternoon he said, although he kept one of each in case he had to dig himself out. That prospect seemed less and less likely to Gawan as Tuesday morning progressed, he said. “Look! It’s not even accumulating,” he said, gesturing outside to the scattered slushly puddles near the pumps. 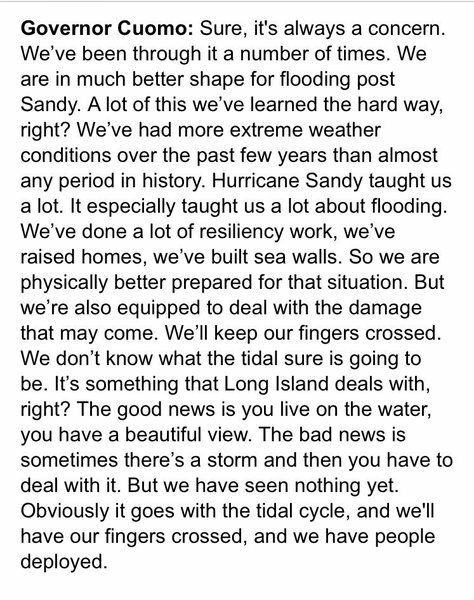 “I’m not really impressed by the storm,” he said, recalling the damage brought by superstorm Sandy in October 2012. “But I hope it’s not going to be bad later on!” he added. Minor flooding was reported at high tide around homes on Long Beach city streets, forcing some road closures. The city temporarily closed roads In the North Park neighborhood, facing the bay, and Park Avenue in the city's West End. Waves in Reynolds Channel were breaching coastal walls on the north bay front, but no homeowners had reported any flooding. An icy slush filled the canal streets while waves lapped at the tidal walls. Long Beach crews had been out since 2 a.m., clearing roads and storm drains of snow and debris. The Long Beach Volunteer Fire department was on standby at all three firehouses for any emergencies, but no major issues were reported. 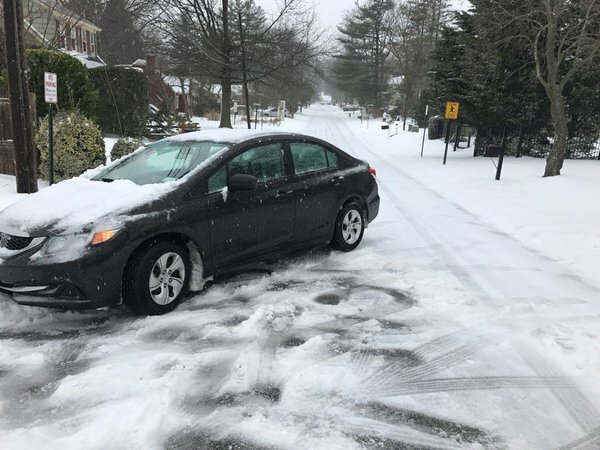 The snow had mostly turned to rain and freezing ice pellets by morning in Long Beach, with a thin layer of slush over roads in some neighborhoods. Officials were concerned about roads icing over overnight as temperatures dipped, and crews were planning to clear roads and drains. Tuesday morning, Islip Town Supervisor Angie Carpenter said the roadways throughout the town were mostly cleared as crews -- operating with about 350 pieces of town equipment and another 300 pieces from contractors -- began plowing, salting and sanding at 3 a.m.
Long Island MacArthur Airport in Ronkonkoma was in "pretty good shape" Tuesday morning, Carpenter said, and good enough that private flights likely wouldn't be affected by the storm. Airlines operating out of the town-owned airport had begun on Sunday canceling flights coming into MacArthur Monday night in an attempt to avoid having their planes get stuck Tuesday morning without a way to fly back out, Carpenter said. All commercial flights for Tuesday had been canceled. With the runways "clear" and "down to pavement," Carpenter said she expected all fights, including commercial, to resume Wednesday morning. High tide along the south shore of the Town of Islip was expected to hit around noon, Carpenter said. Flood-prone areas, like West Islip, Bay Shore and Oakdale, which Carpenter called "the usual suspects," were bracing for coastal flooding, she said. 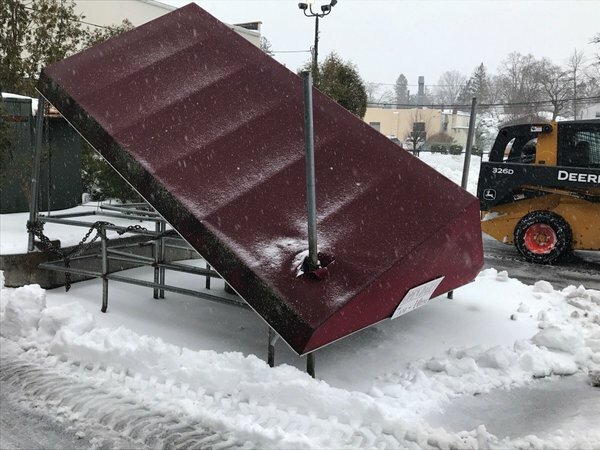 For those in urgent need of fishing equipment during Tuesday's winter storm, Bob's Bait & Tackle in Amity Harbor remained open. Thought no customers had come in by midday Tuesday, owner Bob Rose was not phased. "I had work to do," the lifelong Lindenhurst resident explained. Deliveries of new hooks and lures sat stacked in the showroom, and Rose, 53, had to put them away in the back, he said. "The season starts in April," he explained – that’s when business really picks up. The inclement weather did not bother Rose, who has owned his shop for 30 years. "Not much of storm really," he said. "Just a bit of slush, that's about it."